To fight the spread of fake news, Facebook on Thursday said it was trying a series of tests to limit the false articles, including working with several news organizations like The Associated Press, PolitiFact and Snopes. Those groups have formed a coalition to fact-check some of the items flagged as fake news across the social network. The Times interviewed James Goldston, the president of ABC News, which is one of the participants in Facebook’s fact-checking partnership, to learn more about the effort. How did the partnership with Facebook come about? James Goldston: We’ve been very aware of the talks about fake news through this whole election cycle. I think we regard this as a core tenet of our public service, which is to give the American people the real facts and information they can use to help make their decisions. When we heard Facebook was looking at ways to deal with the fake news issue, we were keen to get involved. And we have pretty deep links with our partners at Facebook. We’ve done virtual reality initiatives with Facebook; we were the streaming source for the election. We have very good contacts there, and were eager to get on board. Obviously we have extensive fact-checking experience through numerous election cycles. So we’ve formalized that team. 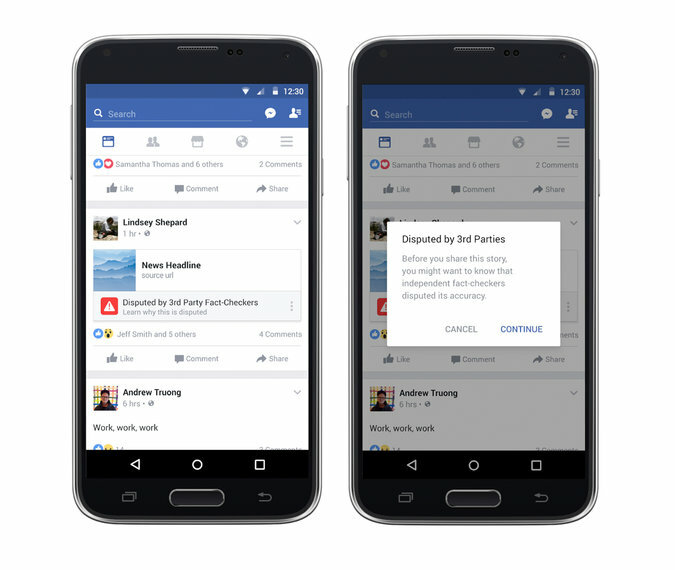 This image provided by Facebook shows some ways the company is trying to curb the spread of fake news. We’ve set up a team of about half a dozen people, and then they will draw on all of the ABC News verticals and our global reporting as needed to get to the bottom of what these stories draw on and what the American people need to know about them. It was set up in an ad hoc way during the election. Along with our assistance to Facebook, what we’ll be doing is putting out packages across all of our platforms — including live streams and short videos — content explaining what we’re finding. We’ll be collating and aggregating what we’re learning about fake news on any given week. The Pizzagate story, for example, we’ll be doing special pieces for those kinds of stories as well. Did you speak with Facebook’s chief executive, Mark Zuckerberg, or who did you coordinate with at the social network? Our main partners are the people who run news partnerships at Facebook. There were certainly decisions within Facebook at a higher level about how they were going to approach this. Will there be any payment for this work? No. I think it’s a genuine public service. We actually regard this as a big part of our core mission. If that core mission isn’t helping people regard the real from the fake news, I don’t know what our mission is. I think we all recognize that the reputation of the media isn’t all that great, and it’s been on all of us to address that and win that trust back. Do you think these moves will make a difference? It’s a first step. I don’t think any of us believe this alone will be the end of the fake news issue. But I think we’ll learn from it and iterate. Hopefully, over time, it will come to have a significant effect.